Ce document au format PDF 1.4 a été généré par PScript5.dll Version 5.2 / Acrobat Distiller 6.0 (Windows), et a été envoyé sur fichier-pdf.fr le 11/03/2017 à 23:55, depuis l'adresse IP 41.96.x.x. La présente page de téléchargement du fichier a été vue 228 fois. the end of the workbook. 1. Make a list of possible topics. 2. List key words relating to the topic. 3. Make a list of possible sources. 5. Find information within the sources. 6. 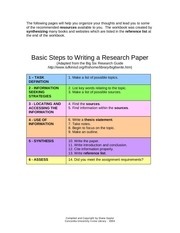 Write a thesis statement. 8. Begin to focus on the topic. 11. 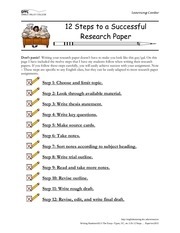 Write introduction and conclusion. 14. Did you meet the assignment requirements? 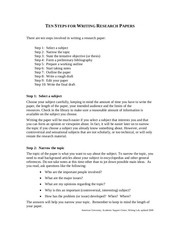 Determine the purpose of the assignment. Do you understand the assignment? about and define your topic. Use KartOO (http://www.kartoo.com). way to narrow your research. materials in the library catalog, or seek help from the reference librarian. school, the grade level, and the date of the visit. the many types of resources: print, electronic, human. 4. What broader, more inclusive, terms cover your topic? 5. What narrower terms could possibly be used? Where do I find the sources? What is available to me? outline below. Use the concept map from the section on Task Definition. summarizing the sources you found. most important part of the paper. reference list which will be discussed in the next section. ◊ Did you use a direct quote? ◊ Did you paraphrase a source? ◊ Did you include statistical data? ◊ Did you include images (cartoons, photos, maps, artwork, etc.)? ◊ Did you use someone’s ideas? 76.7 .P83 2001). This is the style you will be using for this assignment. and foster care. Golden, CO: Fulcrum. Eisenberg, E. (2001, January). The adoption paradox. Discover, 22 (1), 80-89.
make sure that you have completed what you set out to do. 1. Did I complete the assignment? 2. Is the research topic clearly defined? 3. Did I give evidence to back up my thesis statement? 4. Did I develop a strong introduction? 5. 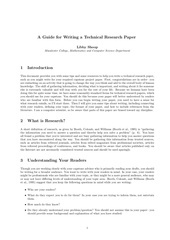 Does the introduction establish the subtopics I covered in the paper? 6. Does the conclusion restate the thesis statement? 7. Does the paper show evidence of my research? 8. Is the paper in a logical order? 9. Did I use my own words? 10. Did I enclose other writer’s words in quotation marks? 11. Did I properly cite all of the sources? 12. Did I use correct spelling? 13. Did I proofread for grammatical errors? 14. Did I maintain one verb tense? 15. Did I explain or define unfamiliar terms? 16. Is the paper neat? use the spell checking feature of your word processing program. quickly generate a wide variety of ideas. Cite is giving credit for someone else’s work. used to write the paper. Resources are items that can be used to help or support. 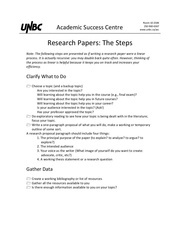 find to help support your thesis. dog include pet, animal, breed. reading the paper. It is usually written at the end of the introduction. could include relaxation techniques, study habits, and test taking strategies. St. Andrew’s Episcopal School. (1999). 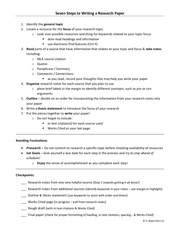 Assignment organizer for grades 7-12. Ce fichier a été mis en ligne par un utilisateur du site. Identifiant unique du document: 00496110.